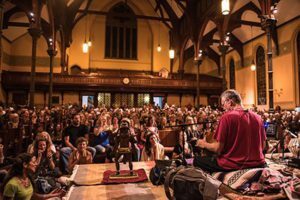 Krishna Das will return to The Netherlands on 26 June 2019 for a live concert in the beautiful KAF Almere (formerly know as Theatre Almere), organized by HeartFire together with LivingSatsang. Buy your tickets here and share the Facebook event with your friends and loved ones! Ticketsales has started. Layering traditional kirtan with instantly accessible melodies and modern instrumentation, Krishna Das has been called yoga’s “rock star.” With a remarkably soulful voice that touches the deepest chord in even the most casual listener, Krishna Das – known to friends, family, and fans as simply KD – has taken the call-and-response chanting out of yoga centers and into concert halls, becoming a worldwide icon and the best-selling western chant artist of all time. His album ‘Live Ananda’ (released January 2012) was nominated for a Grammy in the Best New Age album category. His most recent album ‘Peace In My Heart’ was released late 2018. 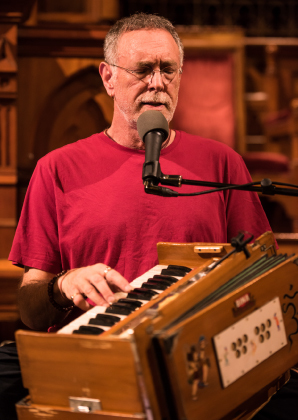 Sharing his heart through music and chanting is the basis of Krishna Das’ own spiritual work; his way of serving the Divine within himself and others. more info on Krishna Das, here. To date, KD has released 16 well-received albums, including Live Ananda (released January 2012) which was nominated for a Grammy in the Best New Age album category. With the release of his 16th album Peace Of My Heart in late 2018, KD on behalf of the Kirtan Wallah Foundation offers nearly two hours of deeply moving, meditative and artfully restrained new recordings born out of a request from a yoga teacher who works with children on the Autism Spectrum. Forgoing the ecstatic tempo changes so common to temple-style kirtan, these 5 new tracks move slowly and deliberately. The song to song steadiness is both striking and soothing, and as emotionally impactful as ever. (looking for the workshop in De Duif Amsterdam on June 27th? See here). KAF Almere is located in the center of Almere. Check the journey planner http://9292.nl/en to plan your journey if you use public transport. Almere is very accessible by train (the venue is a 15-minute walk from Almere Central Station). If you travel by car then parking is very easy in the nearby ‘Hospitaalgarage’ or ‘Schippergarage’ (both are a 5-minute walk to the venue). We would appreciate you to consider the use of public transport or bicycle. See the route description to KAF Almere on their website, here. Ticketsales has started and can be purchased thru the website of KAF Almere, here or by phone: +31 (0)36 84 55 555.